Back at a point in my life when I thought that I had more money than brains – although it turned out I was lacking in both – I succumbed to the need to own a custom built rifle. Somehow I got hooked up with Pete Grisel a gunmaker who was operating out of Bend, Oregon at the time. Pete was not just a stockmaker, but a fine machinist as well and in time I ended up having four rifles made up; a .280 Remington, a .375 H&H, a .17 Remington and a .22 rimfire. 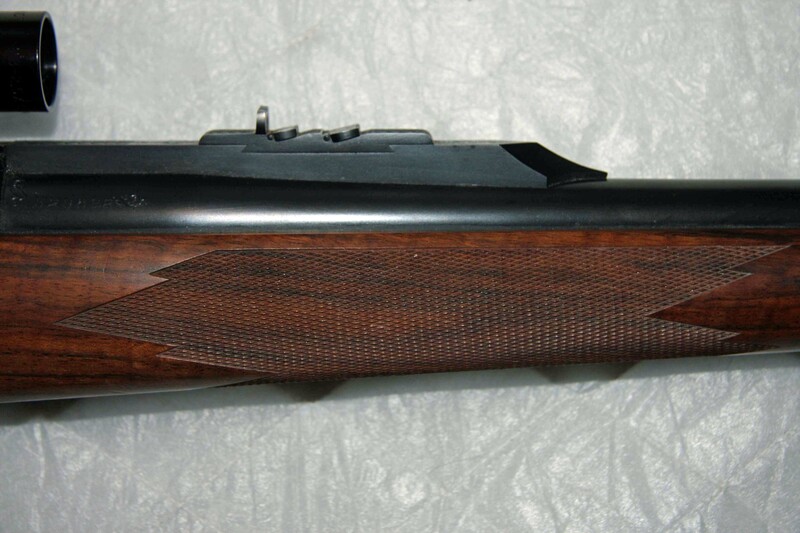 The first one I had made was the .280 which was built on an action stripped from a lightweight Husqvarna. 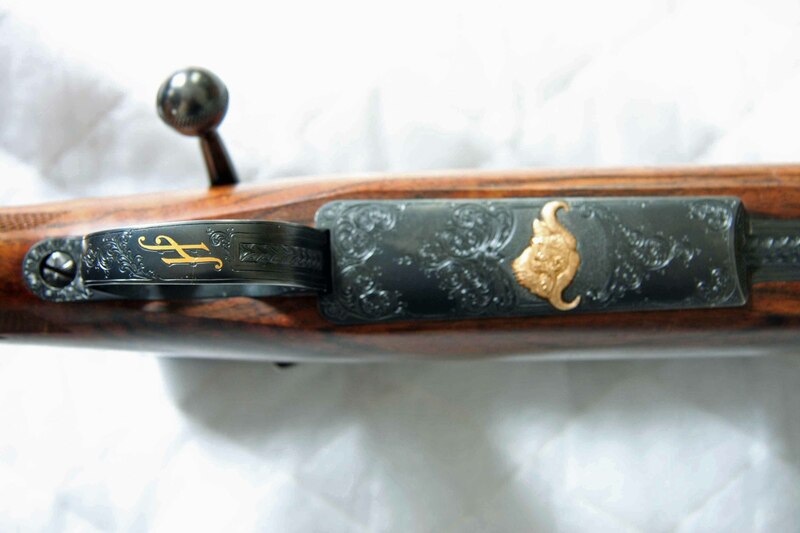 I went for a full mannlicher stock and a touch of engraving on stock’s end cap. I hunted with it for years. It was (and is) a beautiful gun which was very accurate and a nice rifle to pack in the mountains. For my second rifle I went overboard. 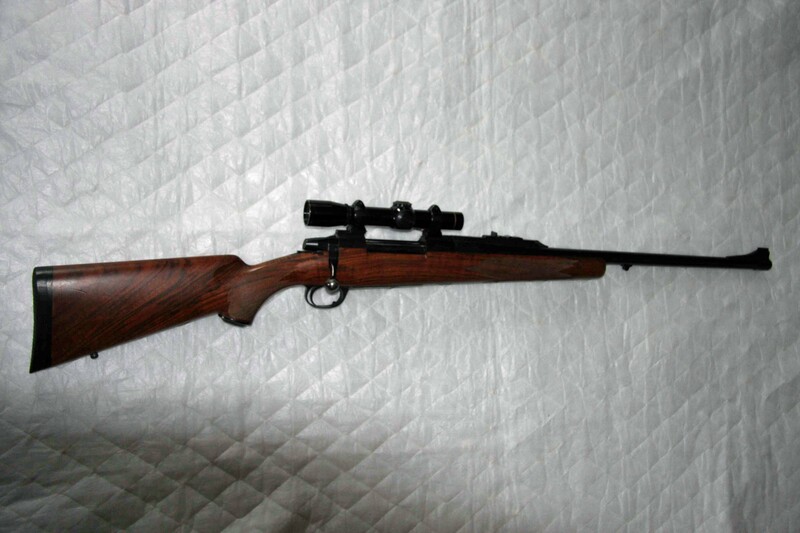 I had Pete make me up the .375 H&H built on a large Sako action. 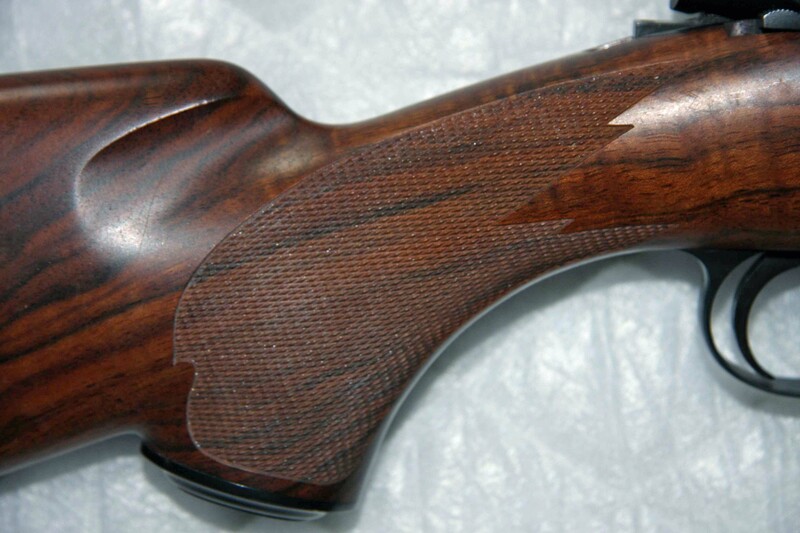 Pete built a quarter rib with express sights for the rifle and stocked it with a lovely piece of what he called California French walnut. The gun shoots lights out and holds its zero from year to year. There’s not much more that you can ask from a rifle. The engraving and gold inlay was done by Eugene Koevenig who lived in Hill City, South Dakota. Gene was a fine engraver and one hell of a nice guy. Unfortunately Gene passed away in March of 2006, another of the really good guys who left us way too early. Please – Not global cooling! There are scientists who argue that global warming is more likely linked to increased solar activity and that carbon dioxide in the atmosphere produced by human activity is not a major factor. If this information checks out it will give their argument much more credibility. Over the past year, anecdotal evidence for a cooling planet has exploded. China has its coldest winter in 100 years. Baghdad sees its first snow in all recorded history. North America has the most snow cover in 50 years, with places like Wisconsin the highest since record-keeping began. Record levels of Antarctic sea ice, record cold in Minnesota, Texas, Florida, Mexico, Australia, Iran, Greece, South Africa, Greenland, Argentina, Chile — the list goes on and on. Certainly it takes more than one snowflake to make a blizzard, but this will be interesting to watch. If this is the beginning of a trend there will a lot of important people who will look pretty foolish so I would expect there to be a lot of resistance accepting any facts that would go against the conventional wisdom that the world will burn to a crisp unless we change our wicked ways. Personally I would hope that this isn’t a shift back to global cooling. Given my druthers I would take the former over the latter (within reason, of course) any day. Before looking at this graph I would have thought that certain States would have had higher percentages, such as Texas and Nevada. However the low ownership in California and DC is a given. I came up with the ultimate plan for world peace. Make everyone speak English – and only English. Because really, how long has it been since two English speaking nations went to war? For all those hunched over their computers making the world right. This one cracked me up. Thanks to The Volokh Conspiracy for the pointer. Science keeps catching up with science fiction. Researchers in New York reported this month that they have created a paper-thin material that absorbs 99.955 percent of the light that hits it, making it by far the darkest substance ever made — about 30 times as dark as the government’s current standard for blackest black. The material, made of hollow fibers, is a Roach Motel for photons — light checks in, but it never checks out. By voraciously sucking up all surrounding illumination, it can give those who gaze on it a dizzying sensation of nothingness. Shades of Harry Potter? Maybe there is nothing that you can imagine that science can’t duplicate – eventually. However I am still waiting for science to come up with controlled nuclear fusion technology. In a previous blog I made some comments about the reliability of reporting in the MSM. I was therefore interested to see a review of the book Flat Earth News, by reporter Nick Davies who takes British journalism to task. (Apparently the book is not available in North America as searches on Amazon and Chapter/Indigo turned up no hits). Davies’s book gives cynical hacks cause to think. It is written by an insider who really does know what goes on inside newsrooms. It captures truths about what happens when principles are corrupted and reporters forced to do too much, too fast. But it is not perfect. Davies admits that. He is a reporter and reporters have always made mistakes. What offends him is the frequency with which today’s reporters are encouraged not to care about accuracy, objectivity and the “fourth estate” values which have allowed journalists to swaddle ourselves in the certainty that our work serves the purposes of democracy. Davies believes “we are deep into a third age of falsehood and distortion in which the primary obstacles to truth-telling lie inside the newsrooms”. At the root of the problem lies commercial pressure, but not the ideological pressure blamed by Marxist academics anxious to portray the press as an establishment conspiracy. Davies blames the more insidious influence of media conglomerates that prefer profit to political influence and pare editorial staff to the bone to achieve it. This leads overburdened reporters to fill the pages of their newspapers with “Flat Earth News”, a worthless commodity defined here as an unreliable statement or story “created by outsiders, usually for their own commercial or political benefit, injected via a wire agency into the arteries of the media through which it then circulates around the whole body of global communication”. The information is not checked. Reporters, raised on the legend of Bob Woodward and Carl Bernstein, have abandoned their obligation to check that what they are writing is true. Being a veteran to whom facts matter, Davies cites numerous examples. This is no different than what we see in newspapers in North America. It is not uncommon to see a story that is simply a slight rewrite of a press release from some advocacy group, with a brief quote from some other group in opposition at the end of the piece in an attempt to bring some appearance of balance to the story. But then sometimes I think it may simply boil down to reporters who just hate to let facts get in the way of a good story, aided and abetted by readers who could care less about facts as long as the story slants toward their personal point of view. Paid volunteers or redundant government employees? I have been stewing about the announcement by the BC provincial government to encourage government employees to “volunteer” for the 2010 Vancouver Olympics. These government “volunteers” would receive half their regular pay and the other half would be be paid with holiday time. It puts a whole new slant on the word “volunteer”. My in-house conscience tells me that if someone paid me for volunteer work we would be financially independent. Maybe so, but then it wouldn’t be volunteer work. It would be a job. But worry not! There will be no cost to taxpayers as the politicians spin it. Colin Hansen, minister responsible for the Olympics, said Wednesday the paid leave would be covered by existing ministry budgets — not by any additional expenditures. That’s the plan – they only use redundant employees. Employees that they are currently paying and don’t need? Now there may be a deeper plan buried somewhere in this announcement, although the Minister says that it is simply a matter of improving the ambiance of the workplace. The minister said the same paid leave was offered to provincial employees who became volunteers during the 1994 Commonwealth Games. Paid leave was also offered to public and private sector employees during the 1988 Calgary Winter Olympics, he added. The minister framed the volunteer plan as part of Victoria’s broader human resources strategy to recruit and retain skilled and motivated workers for the public service. “We need to put programs in place that make the provincial government a magnet employer,” said Hansen. Giving them the benefit of the doubt, this argument may fit with the government’s concern that they are looking at an outflow of senior staff retiring in the next few years and need to generate an inflow of young replacement talent. But still the remark that there will be no additional cost, because they will be using employees who are not needed, rankles. It may not have been the best example the Minister could have given. There is always curiosity about people who win big lotteries. How do they spend the money? Are their lives better for the win? Who hasn’t spent time fantasizing how they would use the money from a big win? We also have a fascination about the train wrecks Those who win big and end up fighting law suits with relatives or ending up broke after a few years of indiscriminate spending. Those people certainly exist but apparently they are preordained to crash. Academics who study lottery winners say their stories tend to recall the opening lines of Anna Karenina, that happy families are all alike, but each unhappy family is unhappy in its own way. Happy winners buy cars and take holidays, remodel their homes, retire early, give to loved ones and charity, invest and save. But for unhappy winners, or those with certain sinister tendencies, the jackpot blessing becomes a curse for uniquely sordid reasons. I think I could handle the pressure. All I need is that big win! Britain: The land of the free? The stories that I read coming out of Britain either make me very happy that I don’t live there or very afraid that they may be the forerunner of our future. They have now proposed that smokers should have to buy a licence to buy tobacco at a cost of 10 pounds. The idea of the licence is to make it more inconvenient to buy tobacco the intent being to encourage more people to quit the habit. He said it was the inconvenience of getting a permit – as much as the cost – that would deter people from persisting with the smoking habit. “You’ve got to get a form, a complex form – the government’s good at complex forms; you have got to get a photograph. It would seem to me that to make it work they would also have to make it illegal for anyone with a licence to buy tobacco and give or re-sell it to an unlicensed person. More laws, a whole new lot of criminals, more penalties and more really useful work for the police. “Government exists to protect us from each other. Where government has gone beyond its limits is in deciding to protect us from ourselves”.